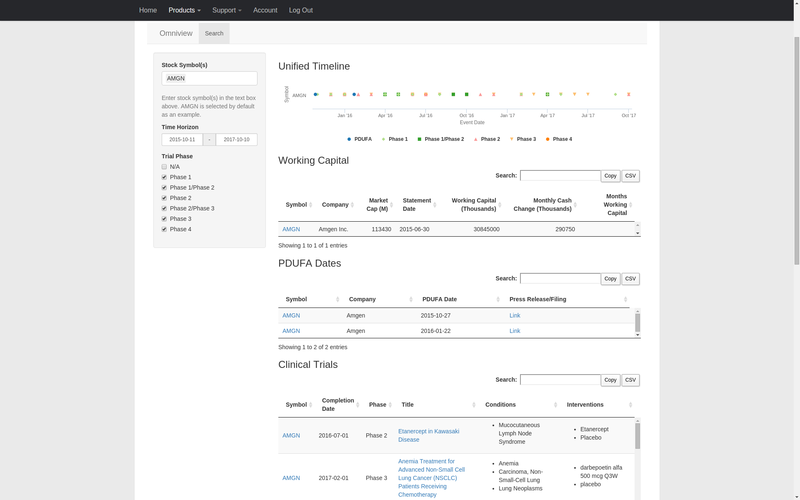 Omniview provides a unified timeline of all working capital runway, PDUFA drug approval, and clinical trial events. These events are searchable by company, time horizon, and trial phase. Omniview is a directed research tool – it’s helpful to identify companies of interest before using it. This stands in contrast to our Trial Tracker and Burn Rate products, which are used to generate investment ideas by screening many biopharma stocks at once. Omniview provides a timeline for all events in our working capital, PDUFA date, and clinical trials databases. The tables below the timeline provide links to all supporting information. Omniview presents a holistic view of all events that are important to a biotech company.